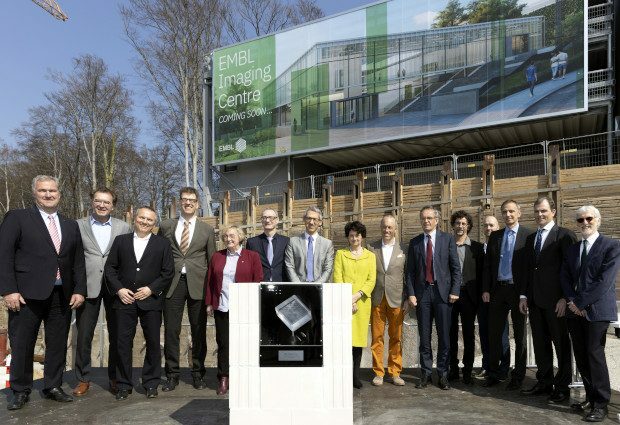 A foundation stone ceremony for the new EMBL Imaging Centre, located on the campus in Heidelberg, took place today. The new EMBL Imaging Centre will give researchers access to the most modern microscopy technologies available. It is made possible by a collaboration between the German Federal Ministry of Education and Research (BMBF), the State of Baden-Württemberg (MWK), EMBL, and by further contributions from industry partners (Thermo Fisher Scientific, Leica and ZEISS), as well as by donations from the Boehringer Ingelheim Foundation and HeidelbergCement. The EMBL Imaging Centre will open in 2021. For more than 40 years, EMBL has performed fundamental research in the molecular life sciences and developed new technologies to further this research. EMBL presently hosts more than 85 highly interdisciplinary research groups across its six sites in Europe. EMBL, which is currently supported by 26 member states, is one of the cradles of the current revolution in light and electron microscopy. 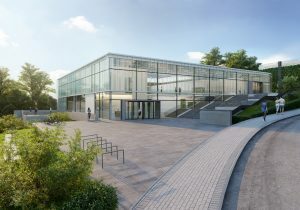 The new EMBL Imaging Centre will be for state-of-the-art high and ultra-high resolution electron and light microscopy techniques, including new developments not yet commercially available. To facilitate this, EMBL is cooperating with the leading microscopy companies Leica Microsystems, Thermo Fisher Scientific and ZEISS Research Microscopy Solutions. The heart of the centre consists of several high-end electron and light microscopes. Among them are microscopes – co-developed at EMBL – specifically configured for linking light and electron microscopy. The combination of these two very different microscopy techniques enables scientists to bring together functional and structural information to gain new insights. The new centre will be open to visiting researchers from all over the world. This means EMBL’s expertise in imaging technologies and data analysis will pass on to other locations, promoting scientific discovery in EMBL’s member states and beyond. As such, the EMBL Imaging Centre will function as a training facility for the most advanced imaging technologies. Up to 300 visiting scientists per year will be able to visit the new centre and get access to the very latest imaging technologies. At the same time, they will be supported by highly qualified experts from EMBL who provide not only training on the microscopes but also on sample preparation and data analysis, tailored to the needs of visiting researchers. An additional aim of the centre is to develop the next generation of imaging technologies for life science applications in close cooperation with industrial partners. An interactive exhibition is also planned for the EMBL Imaging Centre, which will be housed in the openly accessible part of the building. The exhibition will allow the public to get insights into molecular biology and the power of imaging technologies, as well as how the research done at EMBL affects everyday life. 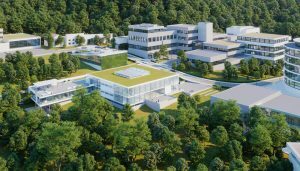 With its concept, the EMBL Imaging Centre makes a strong contribution to Heidelberg as the “knowledge city of tomorrow” and cleverly combines architectural with programmatic openness. For this reason, the International Building Exhibition (IBA) in Heidelberg named the EMBL Imaging Centre an IBA project. The total cost of the EMBL Imaging Centre will be around €48 million. Of this, €28 million will be used for the building itself and €20 million on the initial equipment of microscopes and supporting IT infrastructure. The BMBF is providing the largest financial contribution for the new Imaging Centre with funding of €29.7 million. The foundation stone ceremony today was attended by more than 100 researchers from EMBL and representatives from the supporting partners. The ceremony opened with a speech from EMBL Director General Edith Heard, followed by speeches from state secretary Christian Luft (BMBF); Baden-Württemberg’s State Minister for Science, Research and the Arts Theresia Bauer; the president of Leica, Markus Lusser; the Chairman of the Managing Board of HeidelbergCement, Dr Bernd Scheifele; and by Dr Jan Ellenberg, project leader for the EMBL Imaging Centre and head of EMBL’s Cell Biology and Biophysics Unit.